The Cartographer's Annual Vol 5 starts with a new vector drawing style with a unique twist. It lets you create maps in a beautiful bird's eye view that makes the landscape stretch out before the viewer. Based on a variation of the CC3 color overland vector symbols, the Overland Perspective style contains lots of unique templates and drawing tools and comes with an arsenal of tips and tricks to make varying the drawing scale across the map a simple process. 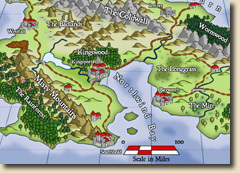 The accompanying mapping guide takes you through the whole process of creating a map step by step.